To be topical, yet subtle. Intensely focused on an issue yet without preaching. On top of that, to achieve the surface below which boils and dances currents of dangerous passions--doubt, loneliness, love, hate, guilt, lust, horror, fear. That may sound pretentious beyond words but in my eyes it describes a difficult, powerful theatrical achievement. 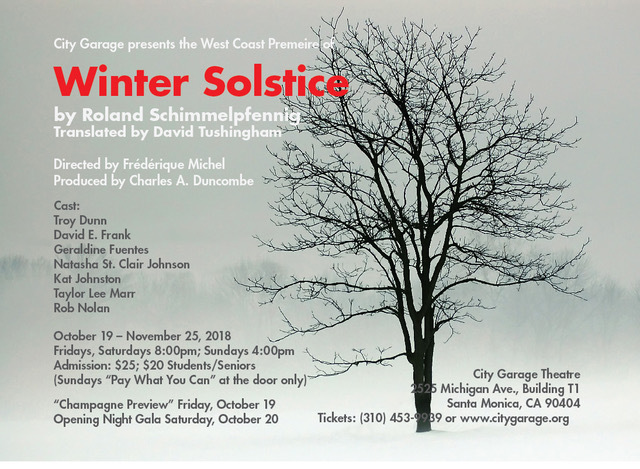 That is how I describe Winter Solstice by Roland Shimmelpfennig, one of Germany's most popular living playwrights. Of course, some find the idea of listening to anyone other than a true-blue American pointless. Which ends up one of the points this play addresses. It proves in some ways the union of two different kinds of story. One, pioneered by Anton Chekhov, is the family-as-society drama. Another is the folk tale of a stranger who asks to be let in one cold night. But is the stranger good or evil? An angel testing your compassion or a devil eager to take advantage of it? 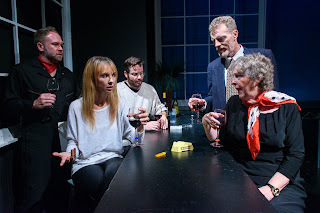 Such becomes the challenge for Albert (Taylor Lee Marr), a comfortably wealthy author with a wife and daughter, dealing with the not-fully-welcome visit by his mother in law Corrina (Geraldine Fuentes). Simply put, Albert seems a nervous wreck. It doesn't help his wife Bettina (Natasha St.Clair-Johnson) is distracted by efforts to direct her film, leaving him to deal with her mother and all the while despising him for the very qualities she had loved him for once--the softness, the gentle way he is determined to remain civilized. Much of what we see and hear comes via the filter of two Writers (David E. Frank, Kat Johnston) who semi-narrate much of the story. Through them we learn many nuances, many details, many tiny moments and their meaning in the narrative. 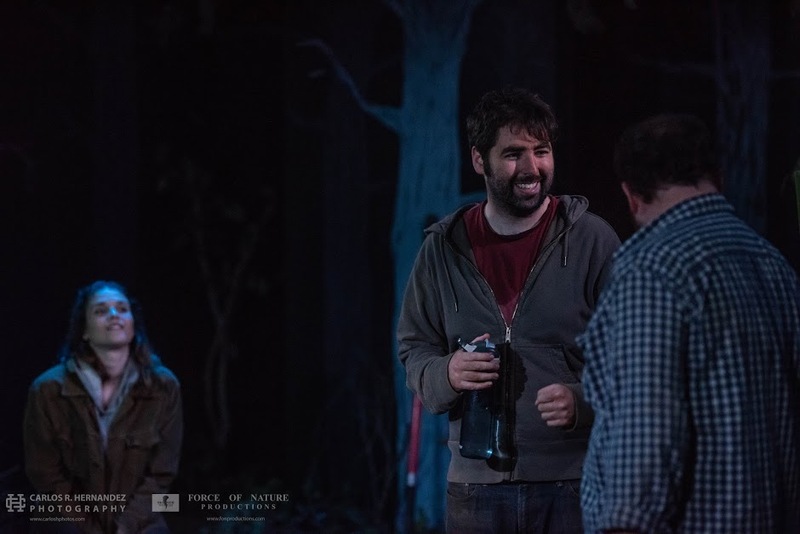 Their presence illuminates as well as challenges--the actors must often pause, becoming still in the moment without losing their momentum, without letting go of the tensions in each moment. 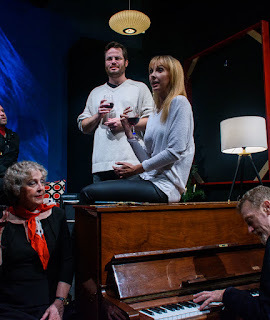 I almost cannot emphasize enough how much the play depends on this cast of actors to make it work--and how completely under the direction of Frederique Michel they achieve it! The essence of the plot begins when Rudolph (Troy Dunn) shows up at their door, a charming older man who met Corrina on the train. Clearly dazzled, she invited him over for Christmas Eve, which is tonight. Adam does not wish to turn a stranger away, not at night amid snowfall. So the Stranger is allowed entry and he starts applying his considerable charm to them all. It soon comes out that, although German, Rudolph was born in Paraguay because his family moved there. Albert, a Holocaust historian, instantly becomes suspicious. Why did a German family move to Paraguay sixty plus years ago? One answer seems pretty obvious, which only adds to Albert's stress. Amid his taking pills for spasms and tensions and allergic reactions to the Christmas tree being mounted then decorated, he drinks a lot of red wine. Well, so does everyone. But the clues mount. Rudolph plays the piano, disparaging non-German composers, mocking Poles and insisting there are no great Jewish composers. He extols what he calls ancient traditions we've lots touch with, eventually suggesting they all celebrate the Winter Solstice instead of Christmas. Never mind the Winter Solstice was last week--reality is what we can make it! And he talks about keeping cultures distinct. Apart. Separate. Don't let strangers and foreigners in. Recognize how nature has superior and inferior types. We should follow nature that way. And so on. Fascism 101 essentially. But charming. Smooth. Comfortable. Even entrancing. Just the small talk of an elderly doctor with reactionary views? Maybe. Or also an agent of a specific agenda? The problem is--Albert did the right thing. He let a stranger in from the cold. More, he is the one who sees the danger but barely counters a thing the man says. He just gets more upset, takes more of his medication, begins to notice how his friend the artist Konrad (Rob Nolan) feels seduced by Rudolph's words. Via a semi-drunken haze he sees a way to unmask this stranger and maybe banish him. Maybe. But he doesn't do it. Should he? The more one dwells on it the more valid seem Albert's fears. Given the intense detail with which these events unfold, his conundrum seems ever more real. Ever more what we ourselves must face. Which makes for a fascinating, swirling human dance of human frailty, good intentions, mistakes and of course lots of temptation. We become part of the events because we seem both there and not, looking in and in some way partaking. Albert's paradox becomes our own. Winter Solstice plays Fridays and Saturdays at 8pm, Sundays at 4pm until November 25, 2018 at the City Garage Theatre, Bergamont Station Arts Center, 2525 Michigan Avenue, Building T1, Santa Monica CA 90404. Having seen a few works by playwright Kerry Kazmierowicztrimm, I went into Gray People expecting fascinating, deeply troubled people in a heart-breaking situation. He did not disappoint. Neither did the cast, nor the direction nor any part of the design. In the middle of the woods at night. A pile of dirt on one side, shovels nearby. Three people in dirty clothes wait. And wait. Then they wait some more. In fact they've been waiting awhile given how one of them keeps glancing at his cell phone. Another hums to himself and makes ever increasing drumming sounds, hands against thighs, until he catches the eye of the first man and stops. The third, a young woman, watches all this, missing not a breath, not a beat. She seems to be waiting for something else than the other two. Just a feeling, that, but strong. Also, very correct. Kudos to the cast and director Sebastian Munos for conveying just that. Eventually these three start to talk a little, much to the first man's dismay and irritation. He calls himself Adam (Kyle Felts) and has been doing this digging job with James (Walter Kartman) for years. He doesn't want to talk because this work is secret. Indeed, their employer insists they never share personal information, even though James clearly longs to--especially with the new-commer, a pretty girl named Jenny (Olivia Lemmon). What follows proves an intense, every growing and changing dynamic as Jenny, the new ingredient to the brew, proceeds to cause all sorts of reactions. James, utterly smitten, cannot hold back from talking (a pretty strong sign of just how lonely he is) and in the process reveals an uncomfortable fact--namely his own obvious mental challenges. Not surprising, given the fact he's easily the worst liar of the three. Adam, on the other hand, deeply resents her presence. He might have disliked any intrusion but her gender clearly presses a button or two. Nor does Jenny's habit of subtly but consistently pushing their buttons help. Well, it doesn't help them. It doesn't help anyone stay silent or keep secrets or remain calm. But then, in retrospect, she didn't want any of that. In the grand tradition of Eugene O'Neill, Edward Albee, and Tennessee Williams, what we watch and hear and feel turns into the peeling away of secrets. One layer after another is cut off, sometimes almost literally. James, so very eager to talk, can barely stop. He shares all sorts of things, including how he feels about this very illegal job they have, how he likes to think of it. He's so open Adam is shocked to realize "James" is his real name. Jenny's secrets are the ones that (almost) come in last. 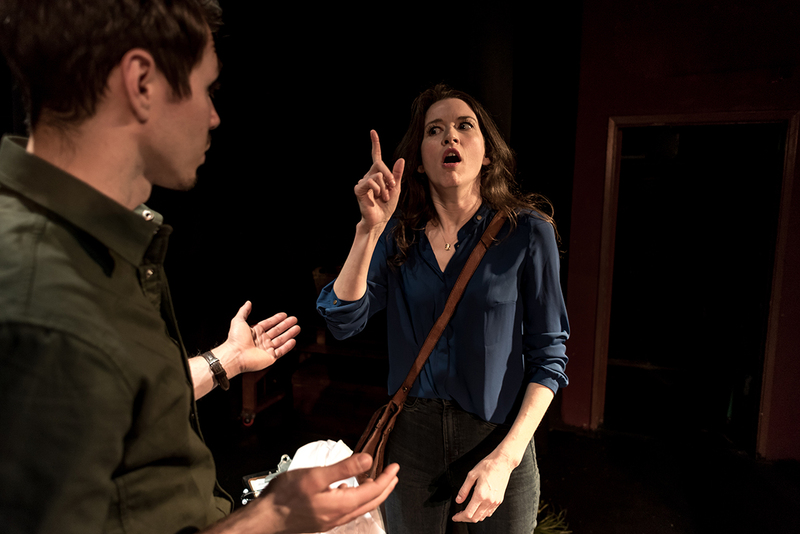 She also gives the play its title, in uttering a piece of personal wisdom the entire show proves utterly wrong-headed. "Gray people" she says "those are the ones to watch out for. Black and white, you know where you stand. Gray people--you never know what they'll do." Ironically, she's right about that in a way. But in the world of the play, as well as in our world, the grays are pretty much everyone. She may think herself White or Black, but events prove her as gray as anyone else. That little lesson in the human heart, like most such, comes at a price and proves anything but cheap. In the dark of night, far from society, when the silent finally begin to talk, they all face some terrible but maybe also wonderful truths. Most truths are a mix of the two, after all. Neither black nor white. Gray. 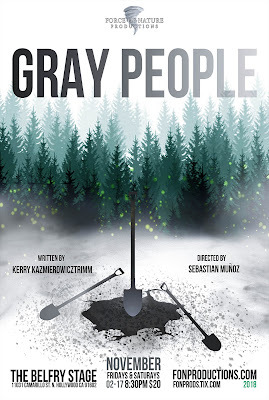 Gray People plays Fridays and Saturdays at 830pm until Nov. 17, 2018 at the Belfry Stage, upstairs at 11031 Camarillo St. (west of Lankershim), North Hollywood, CA 91602. 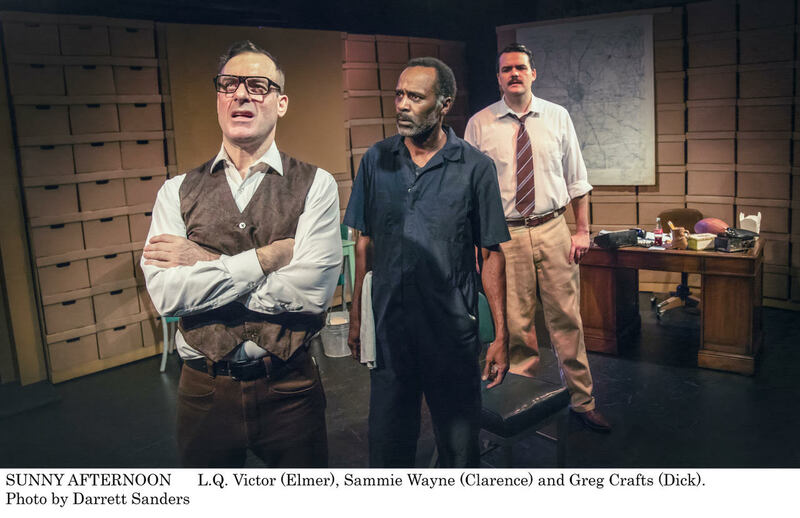 This marks the first review in a series, based on a group of interrelated plays by Christian Levatino. Sunny Afternoon deals with the police officers and others involved in interrogating Lee Harvey Oswald, the man arrested and charged with the 1963 assassination of President John F. Kennedy. I feel conflicted about this play. Very much so. Because honestly the characters come across as vivid and complex, with a totally believable dynamic (even the very secondary characters who of course don't usually end up with nearly as much nuance) and an almost startling degree of detail. I believe in these people as written, in their personal stories, how they cope with truly extraordinary circumstances. More, the plot itself propels itself with a very nice blend of mystery, humor and tension. Along the way let me praise a truly fine cast, who breathe life into their roles with vast skill. 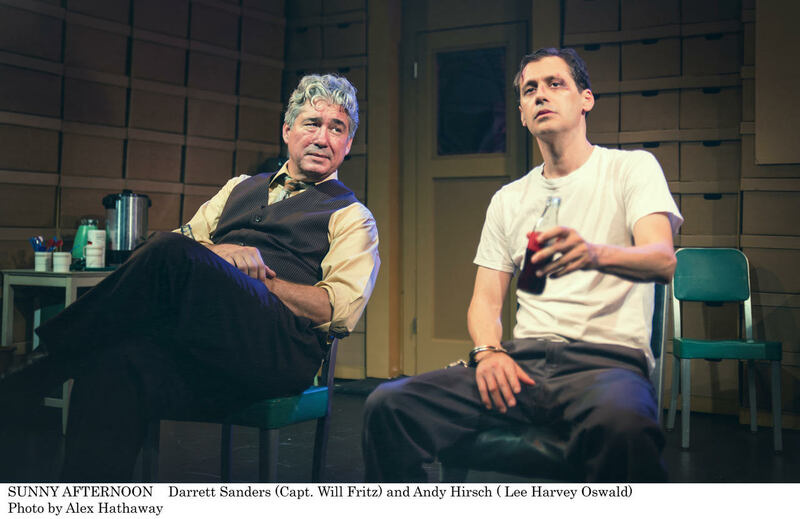 A lot of that seems most obvious with the central characters, Dallas Police Captain Will Fritz (Darrett Sanders) and Oswald (Andy Hirsch). Their interplay with each other and pretty much the rest of the cast shows exactly what good acting is, as does pretty much everyone else (Jeff Doba, Greg Crafts, Spenser Cantrell, L.Q. Victor, Sammie Wayne, etc.) Not least is the fact all the main characters and even the vast majority of secondary characters change based on with whom they are speaking. This simple fact helps lift the whole production into a higher level, as it does whenever actors do so. It kept my attention riveted, my emotions involved and my mind eager to see what happened next. 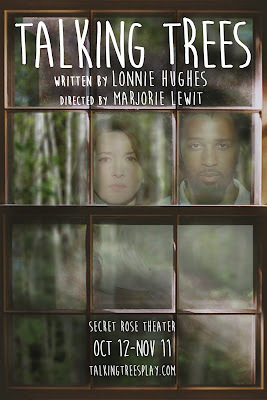 I enjoyed watching this play and think most folks would enjoy it in the same way as myself--but hopefully with a caveat. So what is my problem? Historical truth. I actually know a great deal about the JFK assassination. 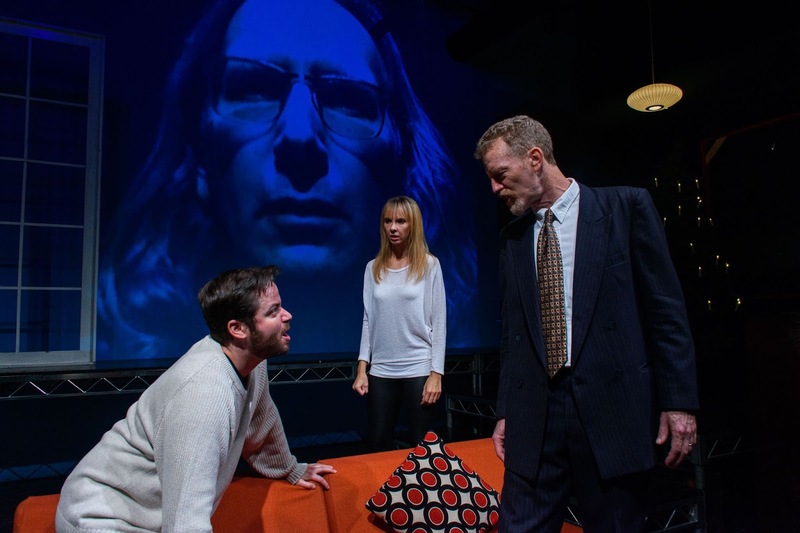 Physical evidence remains overwhelming, which makes the central premise of the play absurd. Oswald did indeed kill JFK all by himself, in part because he was exactly the kind of violent loser who goes around killing people to become famous. This week of all weeks maybe we should remember such people exist. Sure, Richard III is poor history at best, while Amadeus gives us a wholly false image of real man, and the musical Evita glamorizes an amazingly petty, shallow human being. Playwrights are not historians. 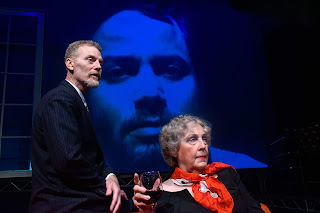 But as entertaining, dramatic, well-crafted (by all concerned) as this play is, it feeds into paranoid delusion topical at the current time. So I feel very troubled by this very well made (in every respect) play. How could I not? On the other hand, I felt myself enter into the world of the play and become totally immersed in same. But the essence is a blend of vast historical accuracy coupled with deliberate misinformation, such as Oswald's portrayal as a good ol' boy brainwashed into a truly stupid assassination scenario. Hopefully this gives you a good idea what you'll find going in. 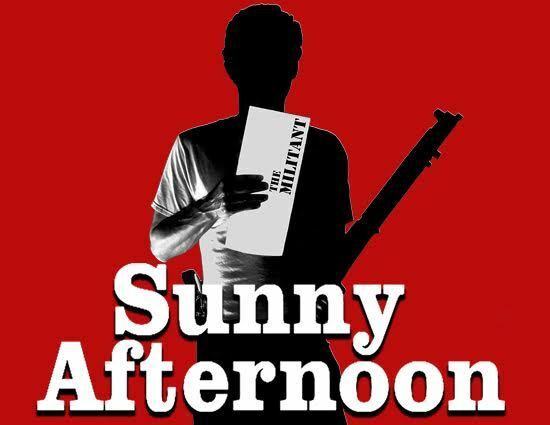 Sunny Afternoon plays Fridays at 8pm and Sundays at 3pm until November 9, 2018 at the Flight Theatre, upstairs at the Complex, 6476 Santa Monica Blvd, Hollywood CA 90038. I went into Talking Trees by Lonnie Hughes knowing very little. I got the impression it was about a difficult human relationship, especially an interracial one, and was written fifteen years before. Mostly, though, the title intrigued. Ended up wishing more had been made of that idea. Trees. Talking with one another. In silence, so low even the breathing of other living things can drown it out. Notice, though, how clearly the idea ended up in my mind? In essence we pick up with some marriage counseling involving Edmund (Jahmone Duhaney) and Angolina (Amy Braddock) with their Therapist (Vince Don Vito). At this point we come across a problem in the play, one that despite everything else good, makes for a rocky start. Quite simply the language is elevated, yet we don't really have a chance to adjust our ears. For another, almost the entire scene is played to the audience rather than between the characters--which is the whole point! Here we meet two people evidently in love--or who say they are--and have problems with communication. But it makes for a difficult start of the play. We struggle to enter into the world of the play. That world tantalizes but takes a bit longer to let us inside. Once we're there, the story and characters grow increasingly vivid, real, human. Edmund and Angolina know they have problems, yet cannot quite tell each other what they need to know. Each becomes distracted. There's a lot of 'on the nose' dialogue for awhile, with Edmund actually asking his best friend Thomas (Ray Tezanos) "Am I a man?" Then there's the almost over-the-top racist Woman (Lindsay Seim) with her weirdly eager willingness to admit a desire for genocide. Yet the elements do slowly cohere. Eventually, a few layers peel away. That Woman we learn was made to fit into a shape not of her choosing. 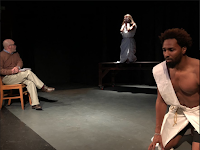 Likewise Angolina's mother (Barbara Ann Howard) whose dislike of her son-in-law seems instant, reflexive, implacable--she reveals herself a victim, someone scarred by life and so left less than she was. 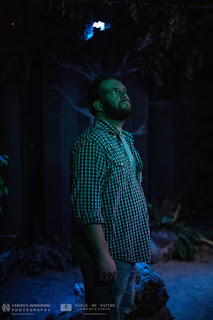 I suppose that is what I took away from the play most of all -- a yearning for life as yet unspoiled, for hearts unwounded and tongues unafraid to speak true. Much of the play becomes a melancholy lament, the actors who have a chance revealing a great deal of pathos. Regret infuses their words and looks. This proved so consistent one must credit director Marjorie Lewit for that particular vision, for the actors all finding that note. And haven't we all felt precisely that odd nostalgia, often for something we've never consciously known? Have any of us in childhood had the life of a tree, communicated as trees do? Maybe that is what the title means. The play does not end happily, not in conventional terms. Death happens, as it must, and in what seems to be beyond the veil of life our lovers meet once more, this time before a tree chopped down. Mixed metaphors there a bit, to be honest. Yet what seemed to emerge from the story, at least in my eyes and through my years, filtered through this heart, is that to become as talking trees is nothing we can reclaim. Rather it is something we must find and create. Then--here lies the biggest trick--keep. So, an uneven play with a few problems. But something at its heart, something to make one feel as well as think. A good production that teased that heart into showing itself. Talking Trees plays Fridays and Saturdays at 8pm, Sundays at 3pm until November 11, 2018 at the Secret Rose Theatre, 11246 Magnolia Blvd. (west of Lankershim), North Hollywood CA 91601. Porters of Hellsgate has pledged to do the entire canon of the works of William Shakespeare. 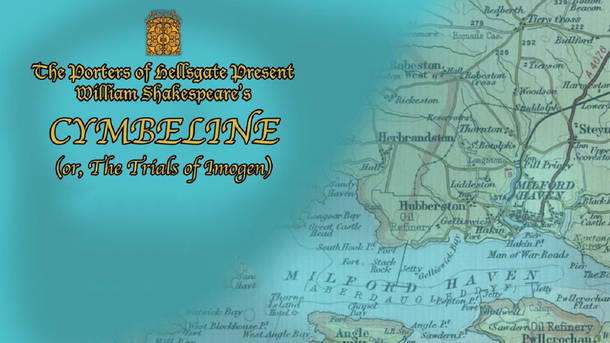 Naturally this includes the more obscure, less produced works which of course includes Cymbeline (or, The Trials of Imogen). Honestly, the script does offer some unusual challenges, not least a very complicated if compelling plot. 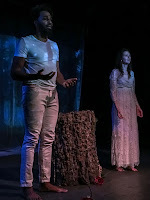 Yet what the play has in abundance is interesting characters, lots of them, and therein lies the drama as well as the comedy of this convoluted tale. Cymbeline (Debba Rofheart) is the King of Britain during the reign of Augustus Caesar, whose heir and daughter Imogen (Cameron Kauffman) has married against his will Posthumous (Will Block), a lowborn orphan raised by the King. Part of the King's rage is spurned on by his Queen (Thomas Bigley) who hopes to make sure her own son, Cloten (Jesse James Thomas) ends up on the throne. Perhaps you've noticed one of the more fun aspects of the show, namely that casting has been pretty much gender-blind. The King, played by a woman, has as his wife a man. What follows in terms of plot is a bet made between the exiled Posthumous and a knavis Italian knight (which didn't exist in this period, but never mind...Shakespeare was a dramatist not an historian) named Iachimo (Jono Eiland) over far Imogen's chastity. 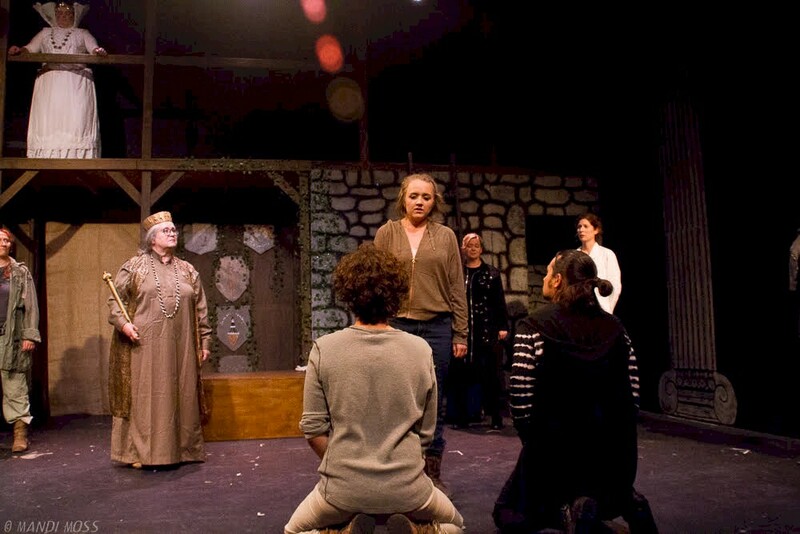 The knave makes for Britain, meets the lady, and quickly realizes he has lost the bet. So he cheats and fakes "proof" of the lady's infidelity. 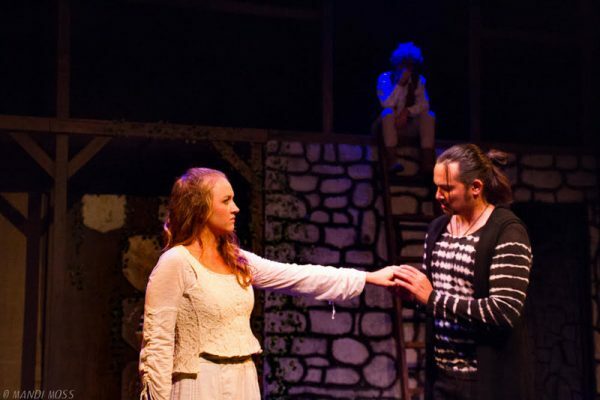 Posthumous, a good guy but like many a young man in Shakespeare also a total fool, believes this and orders his servant Pisanio (Alexandra Wright) to murder Imogen--an act the servant refuses but pretends to commit. Rather than even try to describe the cascading events that follow, let me praise the production which makes this whole plot not only flow but entertain! In fact Charles Pasternak's direction does much to help us follow events, which frankly get more and more complicated. 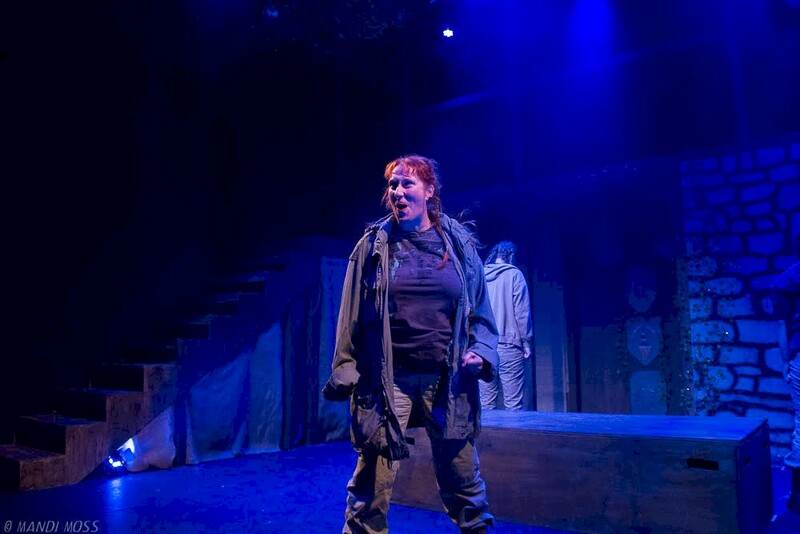 For example, eventually we meet a soldier (Dawn Alden) and his two adopted sons Guiderius (Cindy Nguyen) and Arviragus (Sydney Rose Walker) who turn out to be Imogen's long-lost older brothers! All this should be too much, but proves nothing of the kind! In fact as fun as the plot does prove, what really carries it on remains the characters, many of whom seem variations from other works. Imogen seems a genuinely strong Desdemona with a lot of Cordelia, just as Cloten comes across as a vain, talentless version of Iago. The biggest villain in may ways presents an image of a young Sir Toby Belch, one who discovers and repents the price of his roguish ways. What is Posthumous but Claudio reborn? All brought to vivid life by a first rate cast! 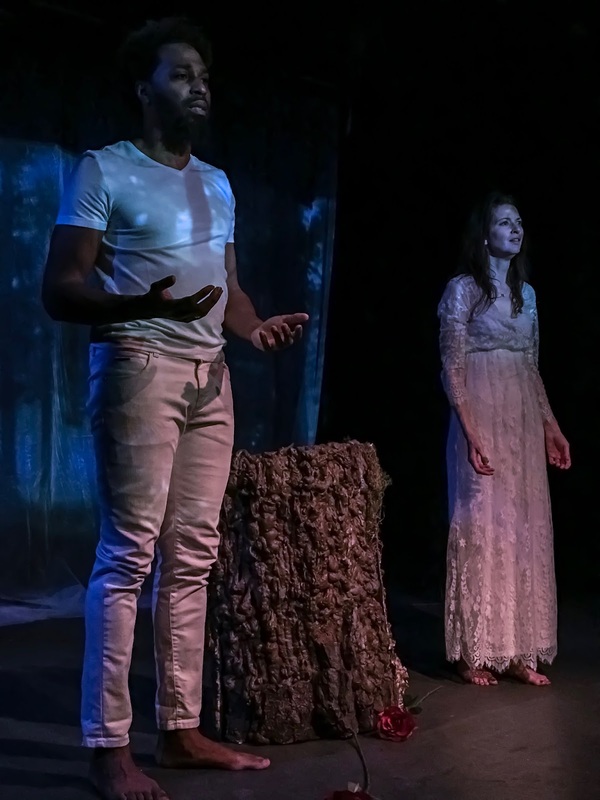 Cymbeline plays Fridays and Saturdays at 8pm, Sundays at 2pm until October 14, 2018 at the Whitmore-Lindley Theatre Center, 11006 Magnolia (east of Lankershim Blvd), North Hollywood CA 91601. 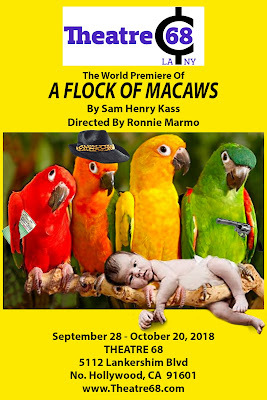 Been trying to figure out the title of Sam Henry Kass' play A Flock of Macaws, playing at Theatre68 in Noho. On the one hand, it might refer to the central character Daughter (Mercedes Manning) and her backstory. She claims to have been abandoned as a baby, found in a zoo between the gorillas and a cage with (you guessed it) a flock of macaws. At one point she expresses a half-sarcastic desire her real parents were the gorillas. So are her parents, whoever they were (including the couple who adopted her) a flock of macaws? Metaphorically? Maybe. Or maybe we're supposed to just think about it, to come up with our own theories. In which case that is mine! Daughter opens with a monologue, directed to the audience. This rarely works. In this case, it does. Frankly, by the first sentence I felt sure this was going to be a good performance. Because Manning didn't just utter lines or give readings--she talked. She spoke to us, telling the truth (albeit not all of it--she is a human being after all) about her longing to find her mother. How this quest was born out of her pain. I believed her. 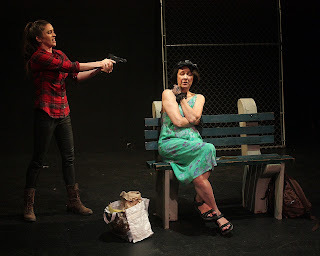 The play deals not with her quest, but what happens when she finds the very strange woman Daughter insists is in fact her Mother (Deborah Geffner) who likewise speaks truth with every word out of her mouth--even when she's lying or deluded or trying not to say anything at all. No small feat! But wonderful to behold. In fact the whole show cut straight to the bone of everything, or tries to. Because the characters of course wiggle and try to avoid the knife! Mother does not want to admit giving birth, dismisses the birth certificate identifying her as a mother, agrees that she might come to admit her identity all the while wandering in word and mind through her own odd inner landscape. What can Daughter (or the audience) do but follow, or try? Along the way we meet Actor (Hansford Prince) and Actress (Julia Valentine Larsons), who will play all parts in the almost flashbacks examining who just might be the Father. Maybe. Just as later they take on the roles of Daughter's adoptive parents, a withdrawn but kind enough couple in Idaho (a place Mother insists does not really exist). The result feels something like a dream, something like an acid trip, and not a little bit like a kind of psychological descent into Wonderland. Or maybe Purgatory. With material like this, the temptation to simply be funny, or generically "weird" would be strong. Not one cast member succumbed,, which serves as a nice tribute to director Ronnie Marmo. Via coaching and/or simply by choosing these performers, he made sure the play never became about the oddity of it all. Amid all the bizarre peaks into a damaged imagination emerges truth. Oh most sacred and fragile Truth. Truth about what trauma is truly driving Daughter to find a kind of anchor in her birth mother. Truth about what Mother's life must truly be like and why she did not keep her child. And in the end, each has heard the other's story. Each learned the others' truth. Thus Dionysus, patron deity of the theatre, is appeased. 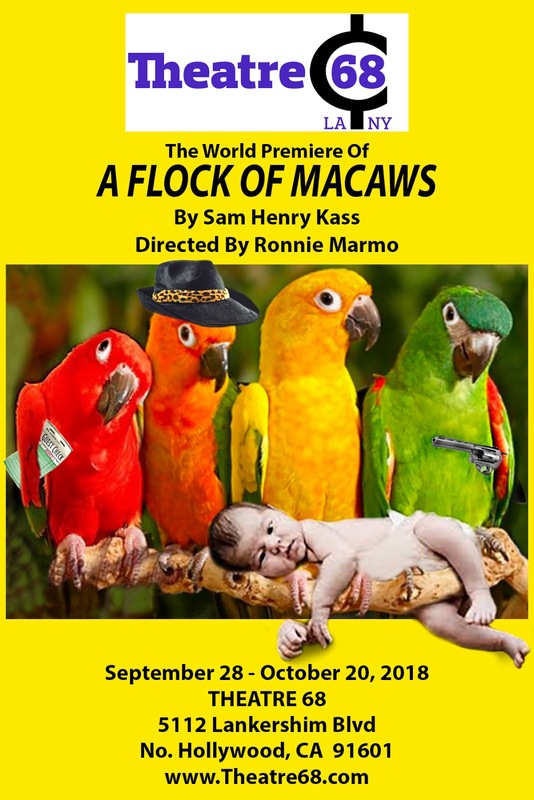 A Flock of Macaws plays Fridays and Saturdays at 8pm, Sundays at 3pm until October 20, 2018 at Theatre68 located at 5112 Lankershim Blvd (south of Magnolia), North Hollywood, CA 91601.